The folks behind the recent SNAP Summit have started a SNAP Chat series, and for their first event, they invited me and Hi5 Architect Paul Lindner to talk about OpenSocial and its place within the larger project of opening up the social web. 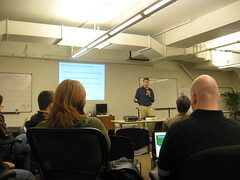 I gave the latter talk, and then Paul did a technical tutorial and deep-dive on the nuts and bolts of OpenSocial. This was the first time I’d put together a public talk on the broader vision of opening up the social web. I described the work that I’ve been doing at Plaxo to support and adopt open standards, Plaxo Pulse, the Bill of Rights I co-authored, and being the first company to implement OpenSocial, but I also talked about OpenID, microformats, social network portability, OAuth, and how these technologies all seem to be converging on a shared vision of how the Open Social Web should work. This talk complements some other great recent presentations by Tantek and David Recordon on building an Open Social Web. It all feels so tangibly close now, and I’m sure after next week’s IIW, it will feel even closer. Once our new friends-list portability project goes live, things are going to get very interesting. Exciting times!